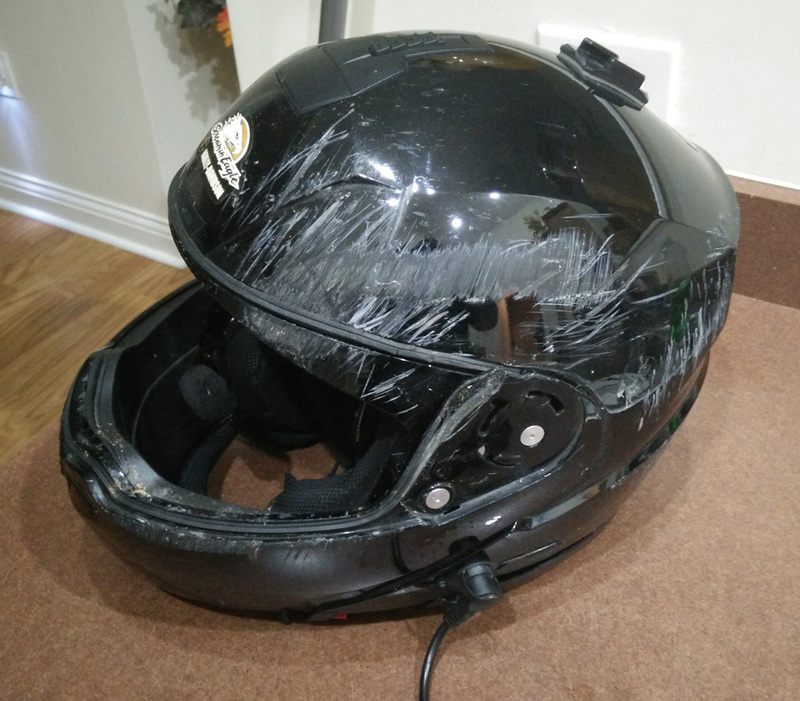 Below are stories from real customers and real riders who have experienced an accident while wearing our helmet. 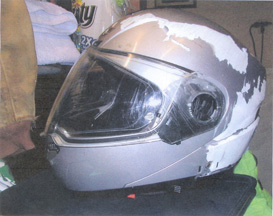 These testimonials stress the importance of wearing the proper gear when riding a motorcycle. It especially stresses why wearing a helmet is so important. HELMETS SAVE LIVES! These stories are proof! Also please remember that ANY helmet involved in a crash or accident should be replaced and never worn again. It did its job and served its purpose. A helmet is made for one impact. Technically a 4 ft drop can render a helmet useless. The integrity of the helmet could have been compromised and there could be a stress fracture or crack that is not visible to the naked eye. Also please note that a helmets life is 4-5 years and after that time your helmet should be replaced for safety reasons. 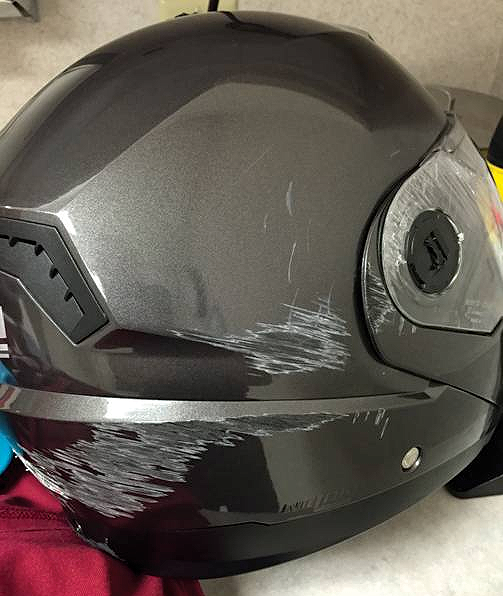 While your helmet may look fine, time and the elements do take a toll on a helmet. Over time the polystyrene and EPS may breakdown and not protect you as it did when new. Also over time odds are that the helmet may have been bumped or dropped and again - a 4 ft drop can render a helmet unsafe. Also every year there are so many improvements in helmet design and in helmet safety. Helmets are lighter now, stronger and offer many more improvements in comfort and safety. And the new helmets fit much better providing a better ride. Helmets save lives! Whether its ours or someone else's please get properly fitted and make sure that you purchase and wear a quality helmet. Your loved ones will thank you! Hello my name is Adam. I would like to Thank Nolan and X-lite helmets for saving my life. I was in a horrible motorcycle wreck on my Honda CBR1000RR last May. I was bedding in new brake pads when a deer ran in front of me on a back country road, I swerved missing the deer but putting myself into a sever tank slapper. I tried to get out by braking when that wouldn't work I shifted into 2nd and was going to power out. The bike kicked left and right about 6 times before I shifted down to power out. The past time it kicked left my left collar bone broke, this dropping me onto the tank. When the bike kicked right it put me head first into an open field. That's all I remember as I was mercu flight flown off the scene to ecmc hospital. I spent 27 days in the hospital before I was back and my somewhat normal conscious self. I broke my collar bone, my neck in 4 places, my back, 5 ribs on my left side and 2 on the right. I suffered 2 brain bleeds and a collapsed lung. I am back now fully healed up and back riding. Thanks to My X-lite 802rr. This saved my life. Unfortunately I need a new helmet and have not been able to get a new X-lite yet. Soon I hope, then I will be confident that my head is safe once again. 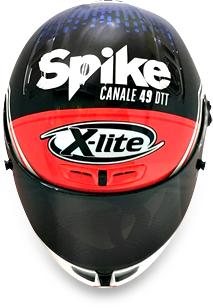 Thanks Nolan X-lite for an awesome 802rr helmet. On July 13 2017 My one and only son was in a very bad bike accident . He had a few bones broken in different places his jaw hurts a bit and the buckle on the strap under his jaw cut him so he had to have stitches. With the hit the cushion may have shifted a little as to how the buckle cut a hole under his chin. But that is not why am writing this letter I wish that you make copies and send it to though out your facility from the CEO to the janitor that day your helmet saved my sons life he may not be able to walk normal with his left leg. He may have broken ribs which causes difficulty breathing he may have stitches in his face but my boy is alive .this I can never repay for the expert workmanship you put into his helmet.there are no words thank you is by no means enough.but thank you from the bottom my heart for each and everyone of you who put a finger on the helmet from the one who swept up the pieces they're not using. To the CEO The to The factory workers making the parts the workers putting those parts together the secretary writing the notes the billing department sending out the bills for those helmets I mean I can go on and on I thank each and everyone of you for my sons life.if he was wearing his last helmet he wouldn't be here we know this. so On behalf of his wife his daughter his son his sisters his nieces and nephews we are so thankful. We get to hug him we get to kiss him we get to talk to him. so when your coming in tired and feel like you don't want to be there and think did any of our helmets save anybody today.look up on the wall which is where I hope they put it.so you can read it. and know that you save the life of Jose from Brooklyn New York. I think I may have completed the circuit for Nolan Helmets. For years I've touted the quality of the Nolan fit and finish. For years I've raved about the value offered by Nolan helmets to the consumer. Concurrently I've been touting the company, its distributors and the quality way it does business. Now I can say that I have gone the whole route. Last Friday I high-sided when I hit a patch of oil. The first thing that hit the pavement was my Nolan N-86, followed by the rest of my chubby little body. Without a doubt, the Nolan saved me from severe injury or worse. From here on out, I can say without question that these are incredibly safe helmets. Your helmet saved my life! On June 2, 2015 while on a road trip to the west coast (I live in TX) I hit some loose gravel in a curve on Hwy 58 just west of Bakersfield CA. The rear tire lost traction sending me off the road at about 50 MPH. I then went about 40 feet down a gravel embankment. Fortunately I was wearing my new Nolan N44 helmet, which I had just purchased about a month before the trip, as well as leather chaps and jacket. I ended up with a broken left ankle, 4 broken ribs, a broken right wrist (which required surgery and a metal plate to repair) and a ruptured spleen which had to be removed. Because of the helmet and leathers I had no head injuries or "road rash". 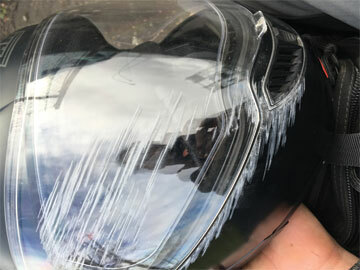 As you can see from the picture, the face shield took the brunt of the impact with some damage to the helmet just above the shield. The face shield did a great job and was still in place after I stopped. I would hate to think what my face woud have looked like without the helmet. The Dr. at the hospital said that he had never seen anyone who had been in such a serious accident without a single scratch on them. All of my injuries were impact injuries. Thank you for making such a quality product. It probably saved my life and definitely saved me a ot of extra pain. - Ben J.
I want to thank you for making a great product. On January 19, 2015, at about 4:15 AM while I was riding my motorcycle to work in Covington TX, when a large wild hog ran into the side of my motorcycle and caused a wreck. When the wreck happened, I was running about 55-60 miles per hour, this was the proper rate of speed for this highway and the road conditions at thhe time. The motorcycle riding gear (helmet, coat, pants, gloves, and boots) minimized my injuries. I did break both bones on my lower left leg, I sustained a triple compound fracture of the shin bone and a separation fracture of the calf bone. However the only injury to my head was a possible minor concussion. 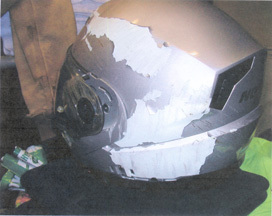 The Nolan N-104 helmet protected my head, but it had some serious damage as you can see from these pictures. 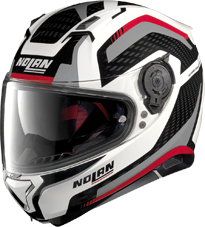 I feel that the Nolan N104 motorcycle helmet that I was wearing when I had my accident probably saved my life, at the very least it kept me from suffering a lot of injury to the left side of my head and my forehead. On Sunday, June 2nd, 2013 I was involved in a motorcycle accident. My 2011 Harley Davidson Road Glide Ultra lost traction in a corner, and I was unable to recover the rear steering condition (wobble). As I ran out of pavement, I stood the motorcyle straight up in an attempt to ride straight through the grass. Unfortunately, as the front wheel entered the grass, it dug into the ground and launched me over the front of my motorcycle. Florida Highway Patrol measurements indicate that I landed 32 feet from my motorcycle, while landing on my head and shoulder. I survived the crash with a few cuts, cracked rib, fractured left ankle, and several bruises. My neck and back are sore, but my head is in perfect condition. The responding Seminole Sherriff's Deputy, said my Nolan Helmet saved my life. I purchased my N43 Trilogy Outlaw Helmet about a year ago at the Helmet Shop in Orlando, FL. Thank you for making a quality product, which I credit to saving my life. While my riding days are done for the foreseeable future, when the time comes to buy another helmet, it will certainly be a Nolan. As I prgress through my recovery, I wanted to thank you for making a quality product that has allowed this father to come back home to his family in one piece. I hope that this letter can bring a sense of accomplishment to you and your team. I offer genuine gratitude in saving my life in my recent accident, and in allowing me to have the ability to write this letter. Please keep up the great work and know that it is not taken for granted - David D.
My wife and I want to thank you for your quality of helmets. On May 6, 2013 we were hit from behind on our 2009 Goldwing which caused the bike to go down and then high side throwing both of us off the bike. My wife ate the asphalt with her right side of her helmet. Thanks to your design and safety features she only sustained a concussion and the rest of our riding gear took a bad hit but saved us. Fortunately we walked away with no road rashes, we only had internal injuries. We will be replacing our helmets with the yellow Nolan N-104 that matches our new 2010 Goldwing. Thank you again for your outstanding quality. - Kevin and Norma B.
Howdy, My name is Rob C. and for the second time in 3 years my Nolan Helmet has saved my life. The first time I was hit by a lady texting and driving. This time it was being hit by a drunk driver. I want to say thank you and ask you if you can use the damaged helmet to help save others lives. I will gladly send it to you and expect nothing in return. If I decide to ride again you can bet that I will be wearing a Nolan. 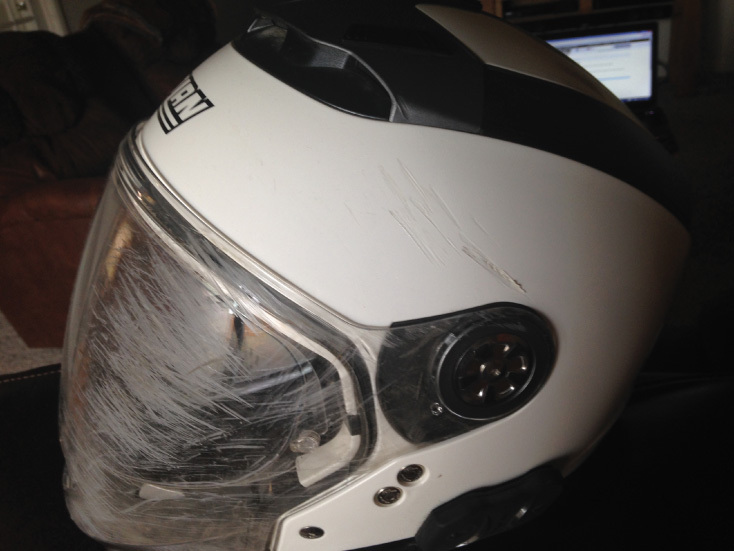 Thank You - Rob C.
My name is Beth F and I'm writing to thank you for the motorcycle helmet that saved my husband's life last Thursday (5-23-2013). He had an accident on his bike and his Nolan helmet absolutely saved his life, the emergency room staff whole heatedly agreed that it was his helmet that made the difference between treating his injuries and planning his funeral. I believe the model he wears is the N100, flip up type. The hinges are blown out on both sides, the windshield broke (though the shade was saved) and, of course, the front and right side are scraped to the top but every time I look at it I am thankful for the product you make. My husband's name is Rick F and he sustained a fracture to his right thumb, a compression fracture in his back and several spots of road rash, as well as, stretched and sore muscles but he is already talking about getting his new Nolan when he gets another bike. He's been riding for forty years and we will sing Nolan's praises to anyone who will listen!! Beth F.
I wish to thank you for the outstanding helmet you made. I just totaled my BMW when a car pulled out in front of me. I will be getting a new bike and will be needing another Nolan. Rick F.
Five weeks ago I had a serious motorcycle accident. I was wearing full gear including my beloved Nolan helmet, which I have stored in my closet. I am 56 years old and the helmet saved me from significant brain damage. I ended up with a concussion and a very small hematoma on the left side of my brain. Without my helmet, who knows what my condition would have been. I have attached my story which I thought you might want to use. I was also wondering about replacing my helmet as I am looking for a new bike (mine was totaled) and would like to get out again as soon as I’m able. Keren K.
I hope this little note gets to the right person, as I felt compelled to write you and thank you for a superior product. On October 20th of this year I was cruising at 75 mph on an interstate highway on my 2010 Harley Ultra Classic. One second I was enjoying a beautiful fall ride, another second I was fighting to maintain control of my bike as the rear swing arm failed. I wrestled with the 1000 pound bike for almost a half mile before I could not keep it on the road and had to decide whether to hit some approaching guard rails or ditch the bike in a shoulder area. I don't remember coming off the bike but when I did I landed on my head at roughly 60 plus miles per hour. Lucky for me just two weeks prior I had purchased a new Nolan N103 helmet. There is no doubt without this superior quality helmet the outcome would have been fatal. I hit so hard my fore head was badly bruised, both eyes were blackened and my left eye was filled with blood. I did receive a broken back but am up and about with a brace, had I not been wearing a quality helmet I fear the outcome would have been worse. I wanted to personally thank you for this quality, comfortable, and good looking product. You saved my life so I can ride once again. Once I am back on the road rest assured I will never wear any other brand. I have passed along info to all my riding friends and they have all told me they will be wearing your helmets. Thank You!! Harry M.
On April 3, 2012 I was on my way home from work on I-85 south when a man in a Honda Accord started to merge into my lane. I was beside him and blew my horn but as he kept coming I was able to see him and he had ear phones in his ears. By the time I realized this he hit me causing me to lose control at around 65 mph. I do not recall anything until they were putting me in the ambulance. I was later told I had flipped over and over (off of the bike) five or six times. The bike, a 2007 Honda VFR anniversary edition, continued another 50 to 65 yards down the pavement, I ended up against the guard rail and the driver did not stop. I was wearing my N102 at the time and I feel it did its' job. I do have a broken neck which may heal without surgery. 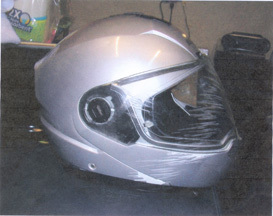 The helmet has a crease about three inches long at the rear right top but it did not open, come loose and did protect a head that was flipping down the interstate five or six times. My friends I ride with have often commented on how they like the features of my Nolan well now they have an even better reason to like it. As I had damage to my right foot (two surgeons said it was the worse tendon damage they had ever seen), I will not be riding for a while but will be purchasing a new Nolan before I do. Thanks for the quality you produce. Dewey M.
I am a police officer in Austin, TX. I was in a serious motorcycle collision on May 4, 2012. 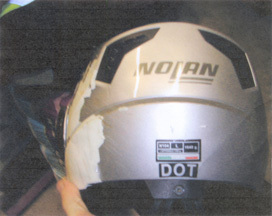 Please send me an email address so I can send you guys some pictures of the Nolan helmet that saved my life. 45-55 mph head on collision. My r1200rt and I against a Saturn Vue. The Vue was totaled. I broke my hip in half on the handle bars and was thrown about 15-20 feet in the air. I landed head first so hard I broke two molars on my lower jaw and fractured my C-6 vertebra. Doctors put bolts and plates in the hip and said I would not walk without crutches for 12 weeks. No surgery on neck but was told I would wear neck brace for 12 weeks also. Got off crutches at week 7 and was told by doctors to take neck brace off at week 8. It's week 10 now and I'm starting to jog again. I want to thank you guys for making such a great product. If it was not for your helmet I would not be alive right now. James H.
Last Sunday I was involved in a motorcycle accident. The bike took serious damage as did I. I wore all of my protective gear as I always do, your Nolan N43 helmet being my preferred helmet. During the accident, I was flipped over the handlebars and sent airborne, I slid on the ground for about 15 feet. During my ground time, the helmet was cut by rocks and the face shield gouged. 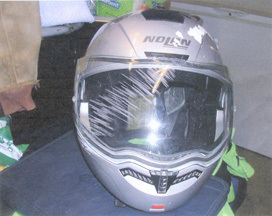 Your helmet not only held up to the abuse, but prevented significant trauma to my head. I wish to replace my helmet with another Nolan, Thank you for your quality product, I know it made a difference. Eric B.
I just wanted to thank you for saving my life in a car vs motorcycle accident the other day. The rest will heal in time, but my noggin is in good shape. And I thank the N 100 E for that! Have a great week! Roger C.
I am writing to thank you so very much for your work in developing a SAFE helmet. My husband and I were on separate motorcycles, with him in the lead riding outside edge. I rode back a few bike lengths and inside along the line. When a pick-up truck turned left in front of my husband, he had 20 feet to get out of the way. Rather than t-bone his head into the truck door, he opted to lay his motorcycle down and hopefully skid a bit.... but at 55 MPH, he did his best, but bounced once and cart wheeled like a ragdoll in front of me. After rolling twice too, he now is facing the opposite direction with his legs over the centerline...in my path. I had more time, did skid, but could keep my bike under control and not HIT the man I married 40 years ago. No, the picture was not pretty for me to see, but thinking of his head hitting and his brains splattering out seems it would be worse. He thankfully had NO concussion. Though unconscious for awhile, his memories of meeting the pavement were erased. I am so thankful and amazed at how well your helmet protected his chin and head. I was not a fan of full face helmets of any kind for about a dozen years, comfortable in my 'shorty' DOT approved helmet. He insisted we buy the Nolan convertibles for our 35th wedding anniv. Now the 'proof is in the pudding' so to speak and we will always wear your quality helmets. Please thank your R and D people for their excellent knowledge. Myself, our children, grandchildren and his biker friends and whole congregation of parishioners will be forever grateful. God bless you all. I just wanted to let you know that thanks to your helmets, I am alive. On July 26th, I was riding on the Cherohala Skyway in the Smoky Mountains in Tennessee, United States. I took a spill on my bike going around a corner at 40 mph and flipped over the handlebars on my bike and landed head first on the ground. I was wearing a Nolan N100E flip face helmet. The helmet took a direct hit to the front left side of my face and I then rolled about 100 feet. Looking at my helmet afterwards, I can see another impact over my right ear where my head hit the ground again. I walked away from this accident with two dislocated shoulders, and some road rash. I had absolutely no broken bones, and most importantly, no head injuries. 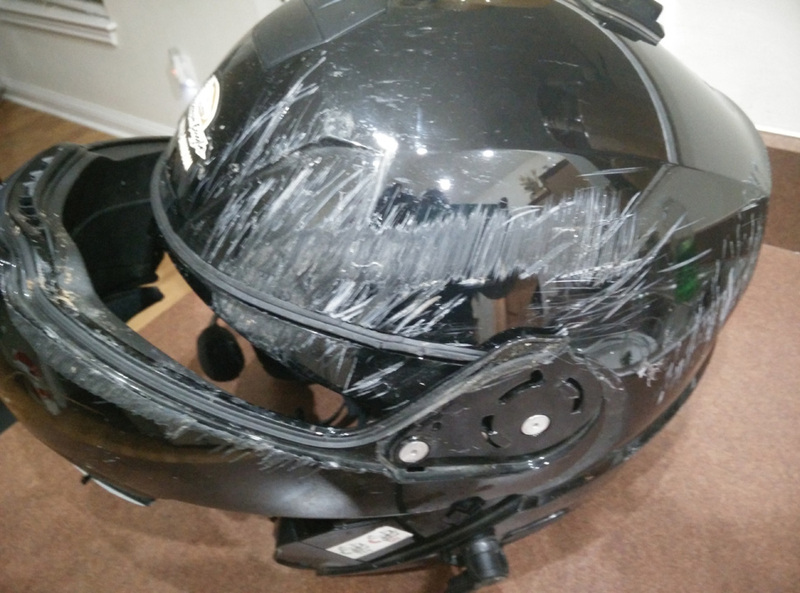 I have included pictures of my helmet showing the impact points. The helmet stayed in one piece and did its job. Even though a large part of the impact was on the face shield, it did not crack or pop off like some people said would happen with a flip face type helmet. I was always happy with the helmet before the accident, and now that I've crashed once with it, I will be buying another one just like it to replace it. Anyway, thanks again for making a great product. M.E.